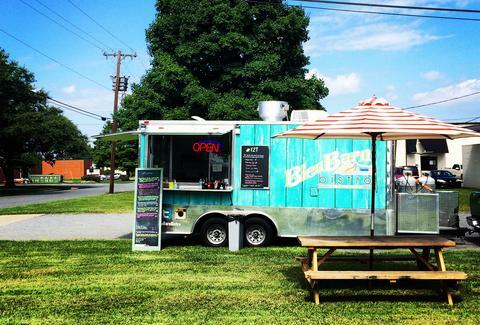 The Charlotte food truck scene has exploded over the last four years from a handful of mobile eateries to a vibrant subculture of the Queen City’s culinary landscape. Trucks are multiplying at warp speed, offering everything from sophisticated bites to downright decadent eats. You’ll find a host of them at Food Truck Friday rallies in South End and Matthews every week, here are the 12 best ones to look out for. A newcomer to the scene, Bleu Barn Bistro is hocking locally sourced selections that it dubs “Farm to Truck,” including one of the best damn grass-fed burgers around, and yes, there's an egg on it. Pasture-raised, of course. Don’t pass on the sides either. Bleu Barn offers fresh items like warm fire-roasted beets and a broccoli salad that’ll make you change your ways. 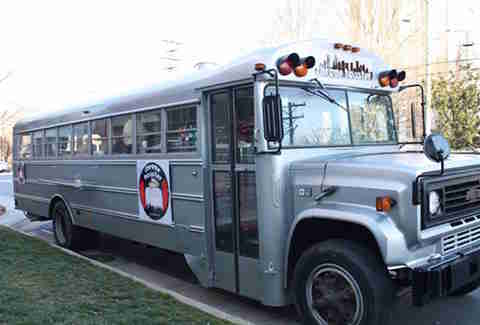 If you see a silver school bus, we suggest you slow down and let the Chrome Toaster take you to school. Serving Latin street food, the Chrome Toaster can be found at various Food Truck Fridays in South End and Matthews as well as Atherton Market on Saturday mornings. Get down on the cheesy Peruvian shrimp pupusa topped with avocado, pickled red onion, and aji amarillo. Hot Box "Next Level Street Food"
Where to find it: Hot Box "Next Level Street Food"
The team at Hot Box brings the heat with their savvy interpretation of international street food with a Southern twang. 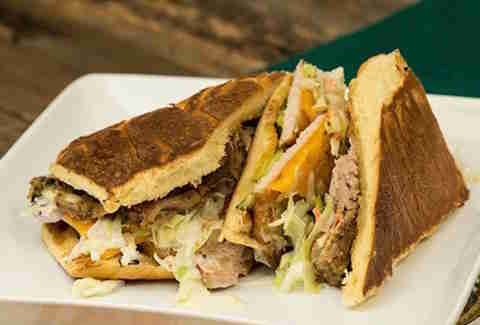 Wrap your hands around the Carolina Cuban, a large-mouth sandwich loaded with coffee-smoked pork loin and mustard-braised pork shoulder, and topped with pickles, sharp cheddar, and a punchy slaw. Also, risotto fritters are your newest guilty pleasure. 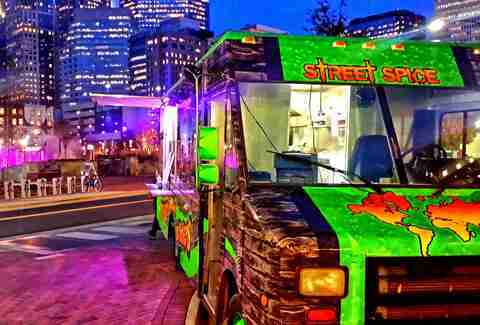 Hot Box makes a regular appearance at Food Truck Fridays in South End. What you’re getting: Taco Wednesdays! Roots made a name for itself by getting real chummy with local farmers and producing some damn fine food in the name of seasonality. While it serves a mean breakfast, you’ll want to hit it up for Taco Wednesdays in uptown right across the street from the Duke Energy building. The sides are fresh and the tacos are plenty -- you’ll find everything from an NC fried oyster taco to pork tacos layered with dinosaur kale and slivered beets. 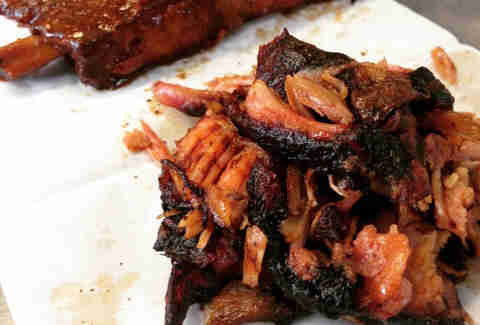 OooWee BBQ is a family-owned food truck slinging saucy barbecue with recipes handed down from the family tree. You can go classic with a meat plate and two sides or indulge your inner fat kid with the BBQ sundae, a sundae cup layered with mac n’ cheese, baked beans, meat, coleslaw, and a drizzle of barbecue sauce for good measure. This carnival-esque food baby weighs in at 1lb. 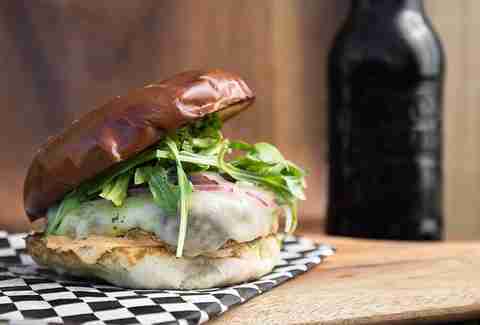 Street Spice hit the streets with a brilliant concept that takes you around the world by way of all the delicious things slapped between two buns. The Brazilian churrasco steak slider drops the flavor-bomb with perfectly marinated flank steak doused with a bright chimichurri and a sweet plantain sandwiched between two buns with that buttery sheen. The only thing better than melty, hot pizza is melty, hot pizza paired with your favorite brewery. Find the Libretto’s truck hanging at some of Charlotte’s best breweries throughout the week, including a weekly appearance at NoDa Brewing on Wednesday evenings, Birdsong Brewing on Thursdays, Triple C Brewing on Fridays, and Sycamore Brewing on Sundays. 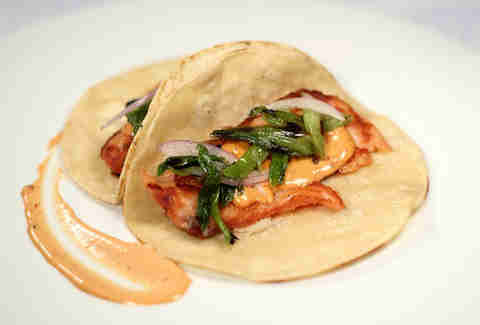 Dig into the specials which are inspired by local farmers and good ol’ New York sensibilities. 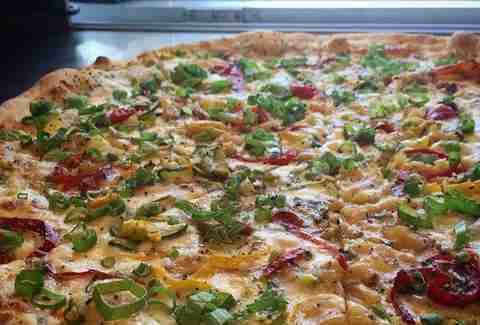 Or, go for the Gusto, pizza topped with Bolognese, cherry peppers, sweet onion, ricotta cream, and fresh herbs. 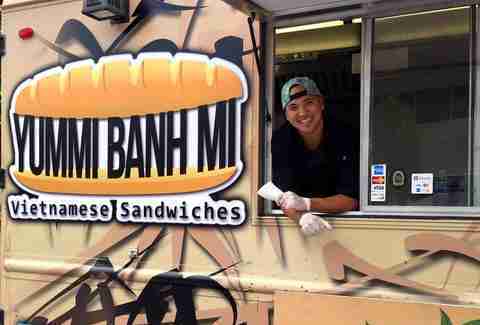 Charlotte desperately needed a Vietnamese food truck and Yummy Banh Mi is serving up authentic bánh mì sandwiches with aplomb. Owner Scott Tang decided to take life by the horns after a harrowing motorcycle accident. Yummy Banh Mi serves up crusty baguettes filled with unctuous roast pork topped with pickled carrots, daikon, fresh herbs, and Sriracha galore. 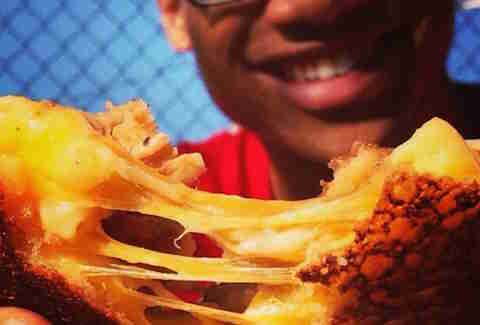 The gourmet grilled cheese truck nails everything you’ve come to love about a good grilled cheese from the crisp, buttered exterior to the stringy tether of melted cheese with each bite. If you’re looking for a gooey classic, the Big Cheesy filled with cheddar, American, and provolone cheeses is your go-to. Want a little more heft? Eat the Pig Mac, a sandwich filled with mac n’ cheese, overnight pork shoulder, and bourbon-soaked onions. Let Papi Queso be your grilled cheese daddy. 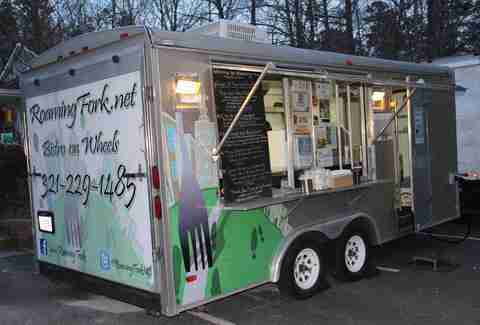 The Roaming Fork food truck was one of the first to land in Charlotte when it hit the streets in 2011. Since then, the internationally inspired truck remains a classic stop on the food truck highway. The menu changes but a few fried steadfasts are money. There are fried deviled eggs, for goodness sake. Fried. Deviled. Eggs. 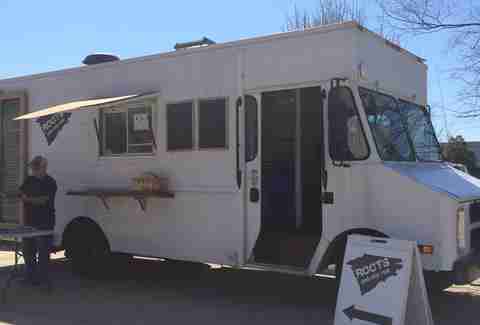 The mobile eatery has become well known for its chef-driven bites (and a recent TV appearance on Diners, Drive-ins and Dives), especially the tacos. But, no one does cauliflower like the TIN Kitchen does cauliflower. Think of a Buffalo wing and then turn it into one of the most creative vegetarian dishes to ever grace your mouth -- roasted cauliflower tossed in Buffalo sauce and topped with a celery root slaw and house-made blue cheese dressing. The Southern Cake Queen is Charlotte’s first mobile dessert truck with an exhaustive list of whimsical cupcakes and Southern dessert bars for the sugar-inclined. The showstoppingly pink food truck, aptly named “The Pink Lady,” roams the streets dispensing sweets wherever she goes. Try the Crimson & Creme cupcake, a red velvet cupcake with cream cheese icing or the bar version, a red velvet cheesecake brownie. Find the Pink Lady regularly at the Matthews food truck rally on Friday nights.